Back when I started training for my first Tough Mudder in 2011, a small group of us began a once-a-week workout that focused on the functional strength that would help us get over 20+ obstacles and 12+ miles. Flipping tires. Swinging sledgehammers. Running in wet shoes. We completed that race, and then a few others did another Mudder the next year. Ever since, we’ve kept up the weekly workouts fairly consistently. The goals: Focus on strength, speed, and power, while designing a session that would work for people of all fitness levels. 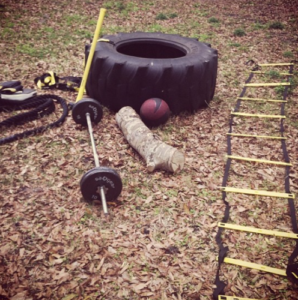 We have lots of toys (tires, sandbags, kettlebells, med balls, boxing equipment, etc…), and I try to mix it up so the workout is never the same from week to week. Just about every time, we get between 3 and 12 of us (though one Thanksgiving, I think we had more than 20). Over the last two years, I’ve alternated hosting with friends Jeanette and Gary, who design some killer workouts in their garage gym. The best part: The group energy. You push harder, do more, and always feel great after what’s usually a pretty intense hour. (The worst part: Burpees.) I wish I had kept track of all the different ones we have done over the years. Going forward, I’ll post them here.